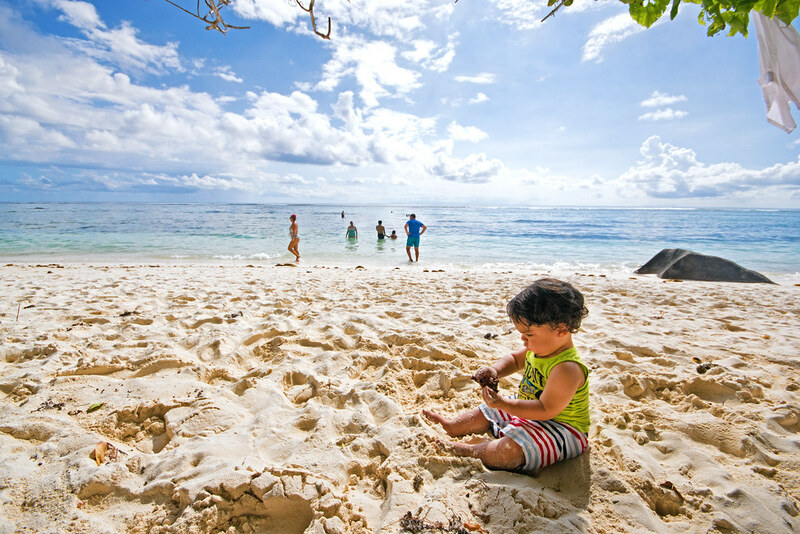 For the longest time, the Seychelles has been one of those tropical paradise islands that we longed to visit. If you know us at all, you know that we are bonafide beach bums, clinging fiercely to coastlines and would happily choose island life ( for at least half of every year at least). 1. Eden Island and Eden Bleu. 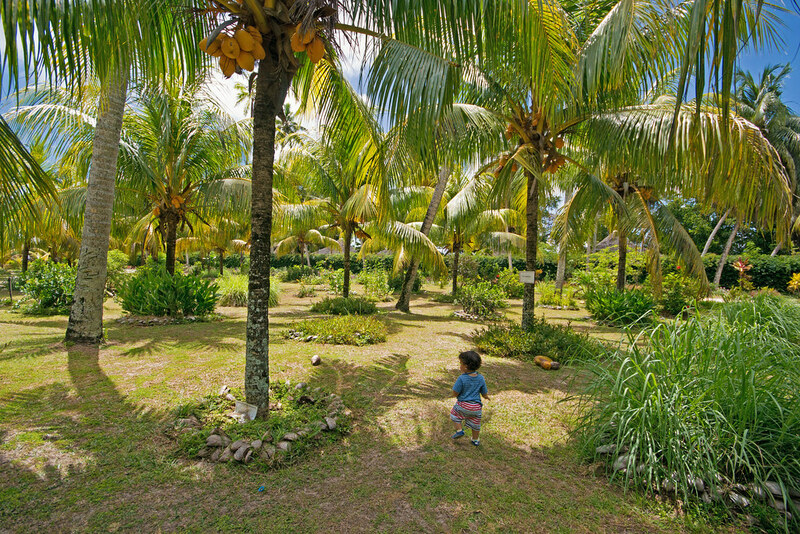 This was the our very first port of call upon landing in Mahe and a perfect choice for families. 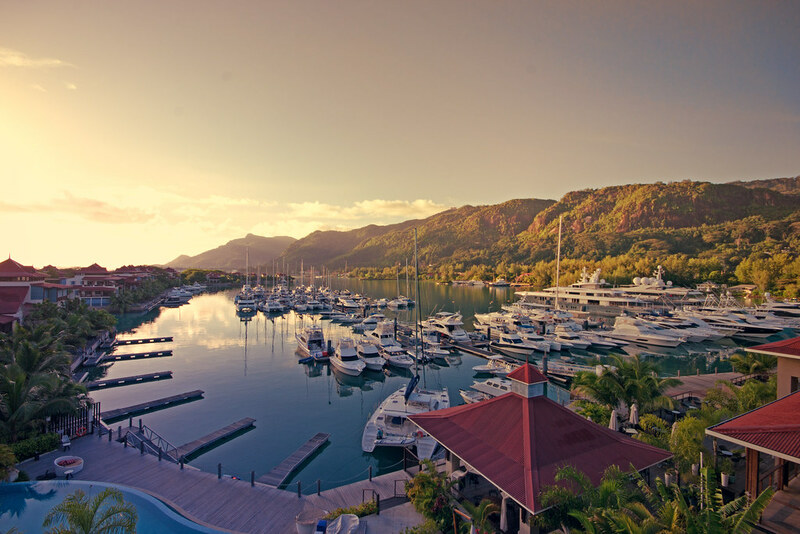 Driving across the bridge leading to Eden Bleu, we could never have imagined the port of luxury that awaited us here. Our balcony offered up the finest view of the marina and there were many times we forgot we were on a tropical island and along the ( Italian revera) instead. Handsome yachts and the most luxurious of vessels parked in the marina as crew came and left the boats they worked on. We lounged in the pool by day with Caleb and loved our evening dinners split between the outside area and indoors. 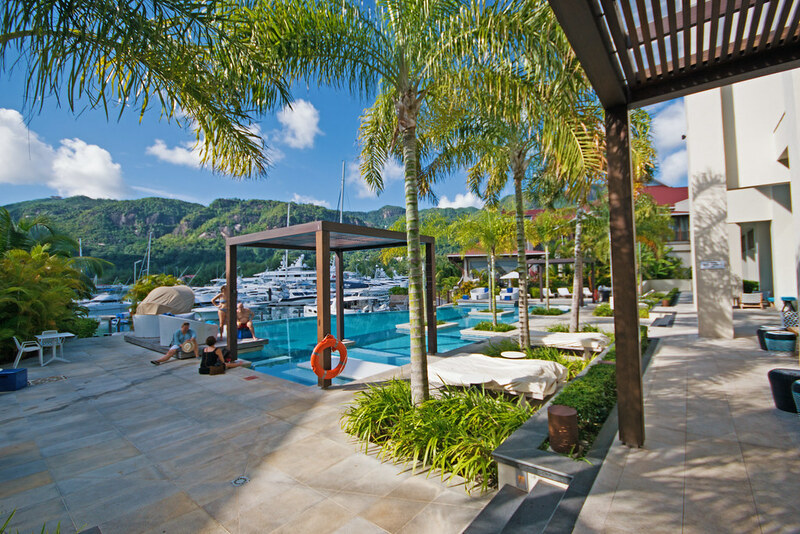 Aside from its sleek and chic interiors, this hotel is right beside the Eden Island mall with many convience stores such a SPAR ( one of the only places in the seychelles where you can find affordable food and drinks) as well as a brewery, aquarium and coffee shop. Who can any other hotel room view compete with this? Loungers, outdoor restaurant seats and Marina views await the the Eden Bleu pool. 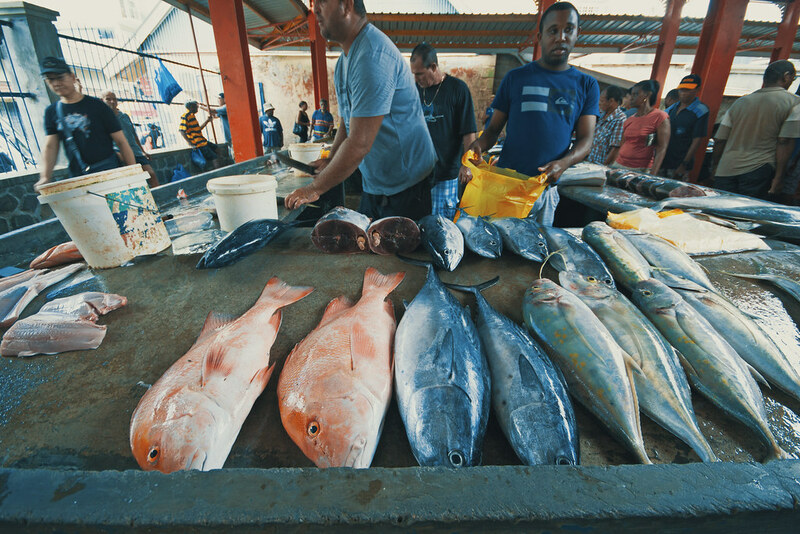 While Vaughan and Caleb relaxed at the hotel I visited the Victoria Market in the heart of Mahe. Colourful and busy with locals and foreigners alike, this market was filled with the fresh catch of the day, every kind of fruit and vegetable you can imagine as well as chillies and other spices. Ladies smiled widely as they weighed my fruit and up above me I shuddered at the myriad of spider webs forming a blanket on the roof of the market with the hugest spiders. Way too high above me to pose any problem, I continued my walk out the market and past the Hindu temple. Fresh fish of all sizes on sale at the market in Victoria. Lively shop fronts on the way to the market in Mahe. 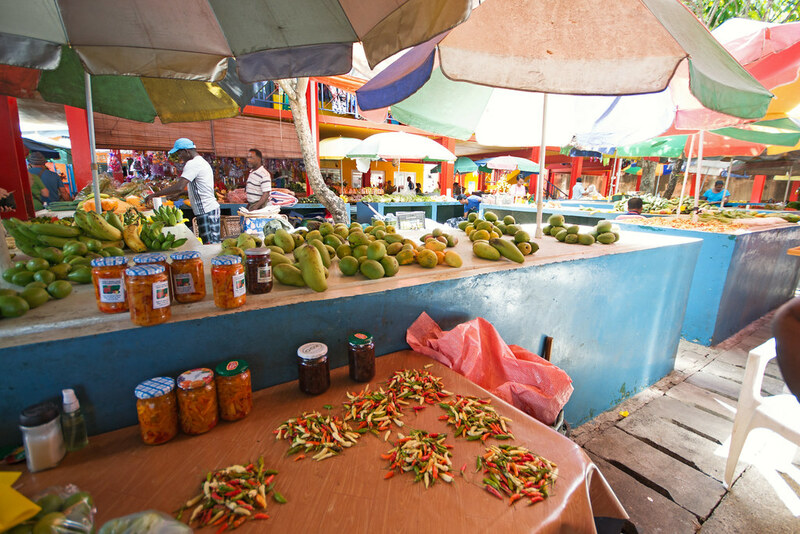 Chillies of all colours and sizes, mangoes, bananas, apples and pears all on sale at the market. After a plethora of turns and mountain bends, our driver stopped at a parking lot somewhere near the top. 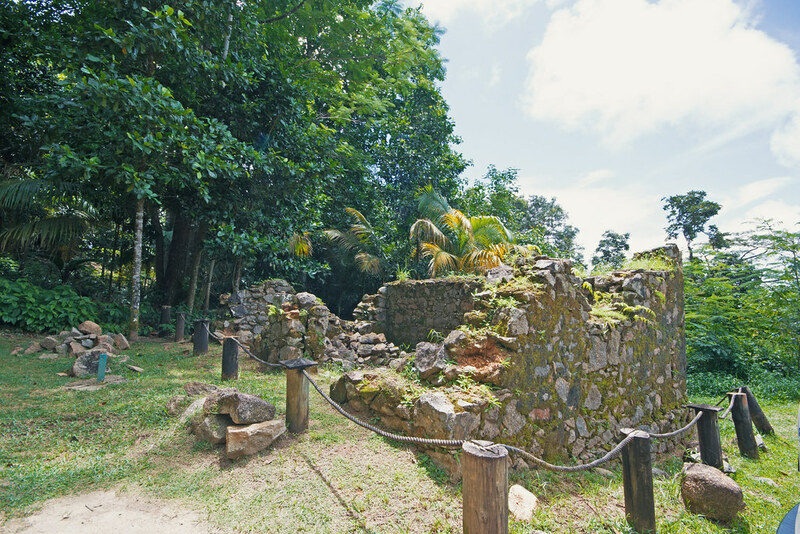 We passed the stony remains of a mission lodge and made our way to a wooden platform boasting the most magnificent view of the island. Lush hills rose out of forested areas and dropped to meet the turquoise oceans. 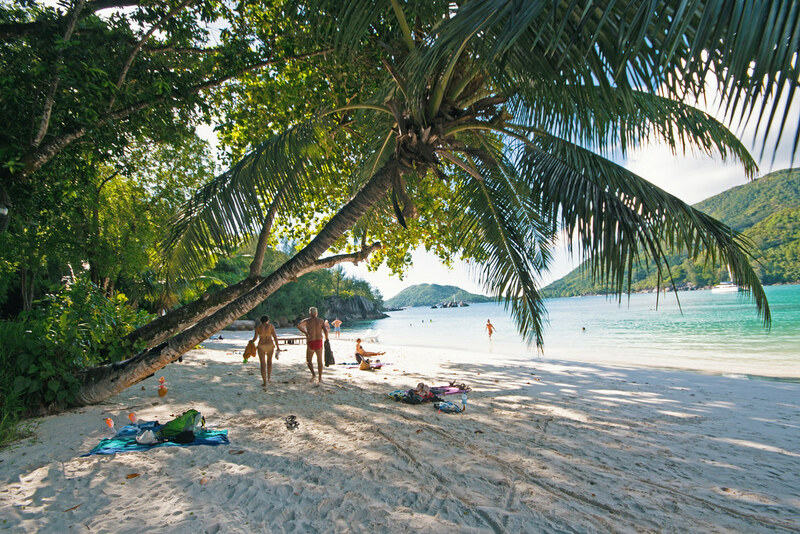 We sat on the grass and surveyed the environmentally rich land of the seychelles. Unknown to use at the time, we sat atop Sans Souci, the highest mountain in Mahe which happened to fall within the Morne Seychellois national park. The only remaining structure from Venn’s Town ( largely used for vanilla and cocoa cultivation), this lodge was originally set up as a school by the Church Missionary society, in 1876-1889 to accommodate children of liberated slaves. Vaughan taking in the islands views from Mission Lodge lookout point. What remains of mission lodge. 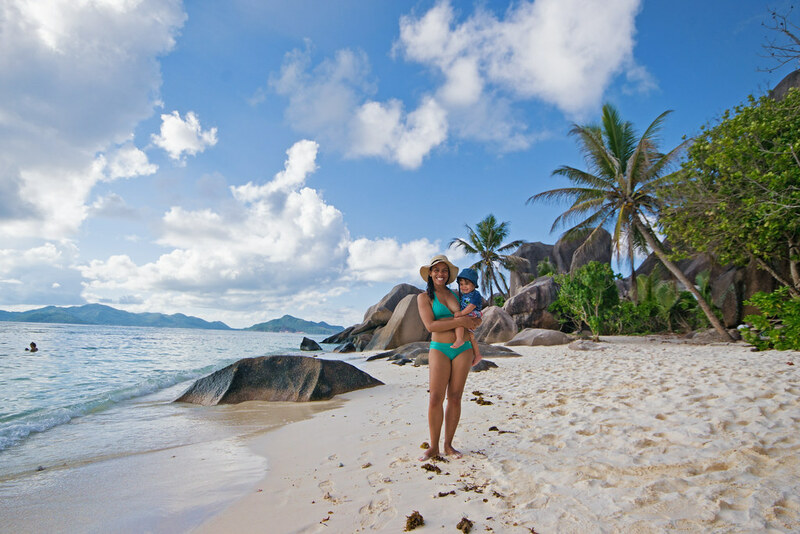 This was my first Constance stay and I can honestly say that this place is a reason alone to visit the Seychelles. Not all staff, restaurant waiters or service providers on the island were friendly or seemed willing to help, but here, from the moment we walked in- we felt true welcome. 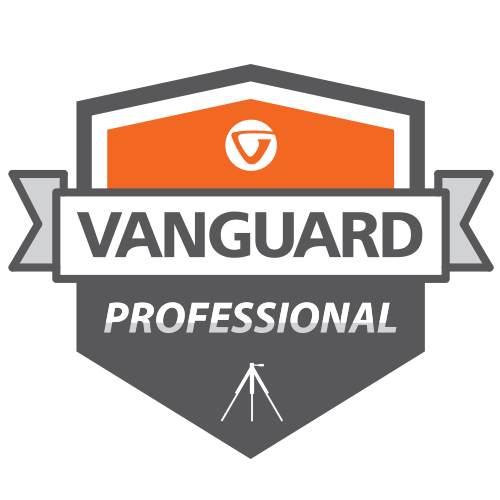 Staff members smiled easily, made every effort to help us especially as we had a toddler. 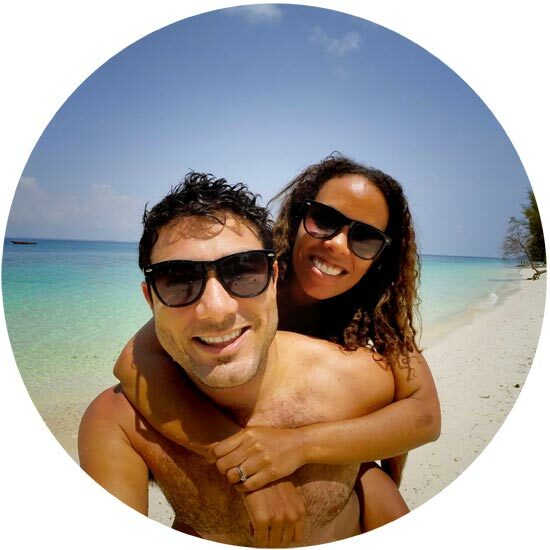 Mauritian Manager, Ehad,was the absolute best host and recalled his time on the island with his wife. Cascades of tropical at our Constance pool. 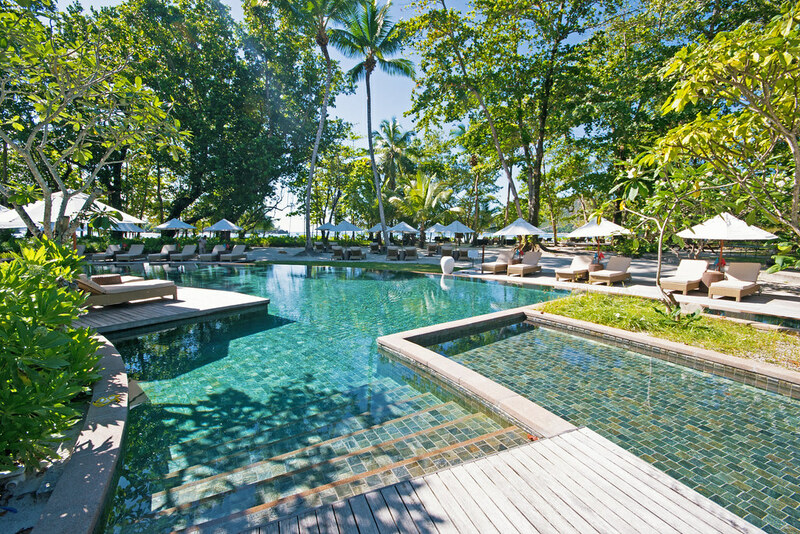 At Constance, this slice of paradise is literally five steps away. Azure ocean waters, mountainous outcrops for good measure and a couple of yachts to make your photos painfully picturesque ( for those not visiting at the time). Caleb and I played in the shade beneath the trees, Vaughan snorkelled and I did some stand-up paddle boarding. With Caleb we always have to tag team so each one of us really got to enjoy the water activities offered by Constance. You have the choice between SUPPing, kayaking and various other water sports. Love SUPPing, but I’m pretty sure I’ve never SUPPed in a place more beautiful than this. I would’ve SUPPed until the sun went down. Alas, the rental shop closed at 5pm. Kayaking, SUPPing, boating and cursing away in Port Launay. 6. Beau Vallon Night market and the Savoy for Dinner. While staying in Beau Vallon, we absolutely loved having drinks and dinner at the classy Savoy. Service was just great and waitresses even offered to walk around after Caleb as we ate dinner. 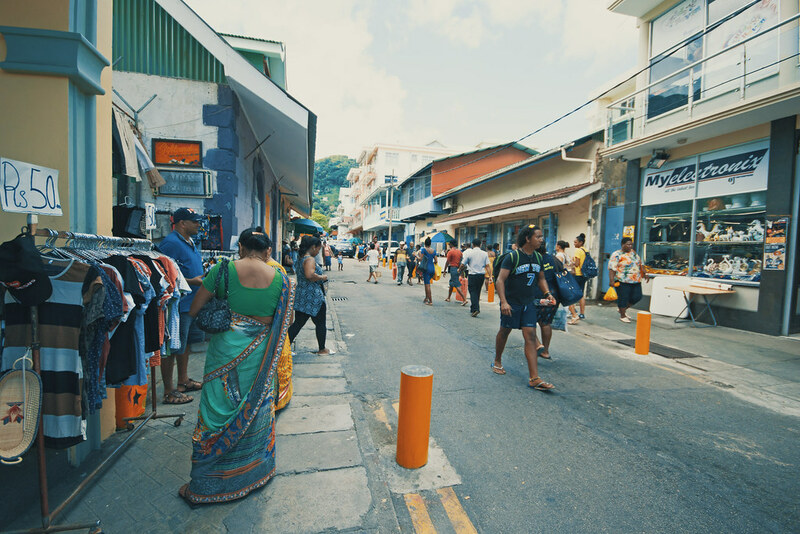 Aside from lovely swims at the Beau Vallon beach, some evenings per week offers up street food and a local market at its best. Serving mostly cocktails, juices and food, this market is perfect to visit in the evening. You can buy your sausage and rice or chicken with vegetables and perch opposite on the beach and listen to some of the music wafting over from the stalls. Voted one of the 6 best beaches in the world by Tripadvisor we had no idea what awaited us when our driver pulled into a sandy parking lot lined with trees. Stepping over pine leaves we stumbled out onto one of the most beautiful beaches we’d ever laid eyes on and we’ve seen our fair share of incredible beaches around the world). Blue, you can’t find any hue to describe it with and just enough wave to give it life, the fine white sand squeaked beneath my sandals as we ducked beneath the trees giving shade to beachgoers. We look pretty peachy I admit, but look at this beach! 8. 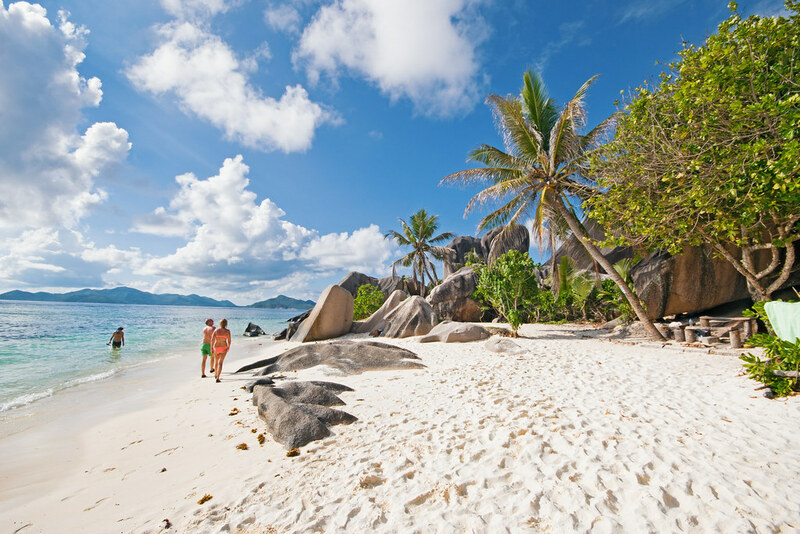 La Digue: the car-free island. I’m in love with the idea of any place without cars or traffic and especially when they come in the form of an island and one as mind-blowingly splendid as this one. 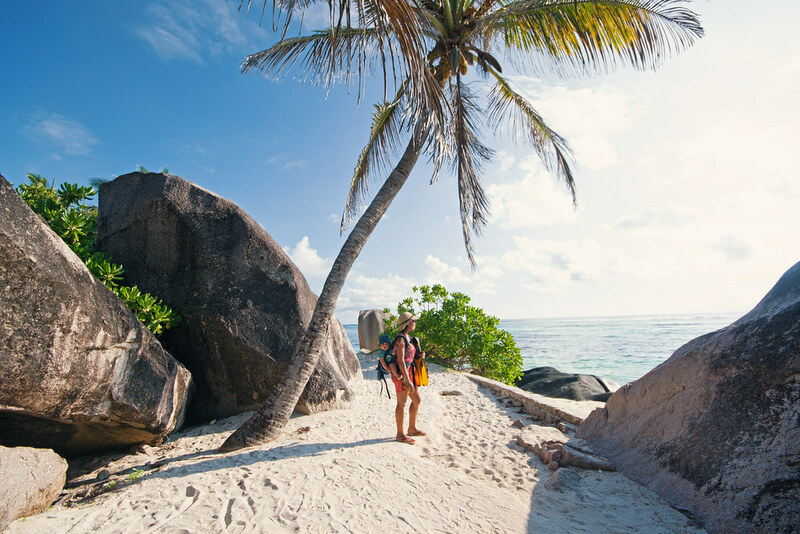 One of the smaller, habited islands in the Seychelles, you can rent bikes or hop on their old ox wagons and mission around to the tiniest of enclaves and beaches with turquoise waters that beckon you to jump in. 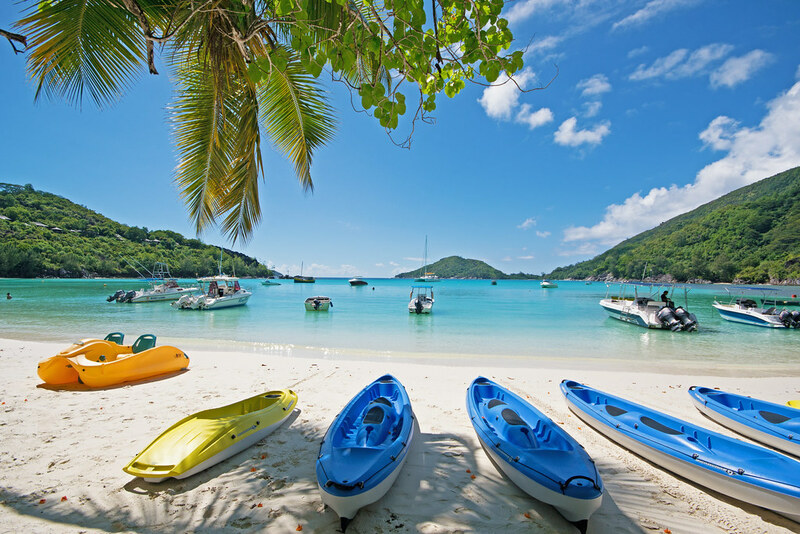 Diving and snorkelling are definitely some of the highlights you have to experience here. 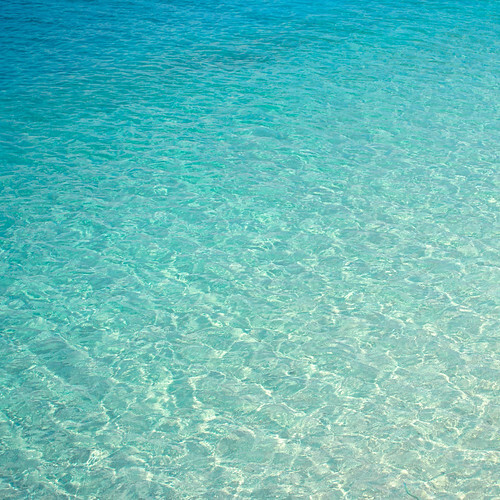 La Digue’s unbelievably blue ocean. 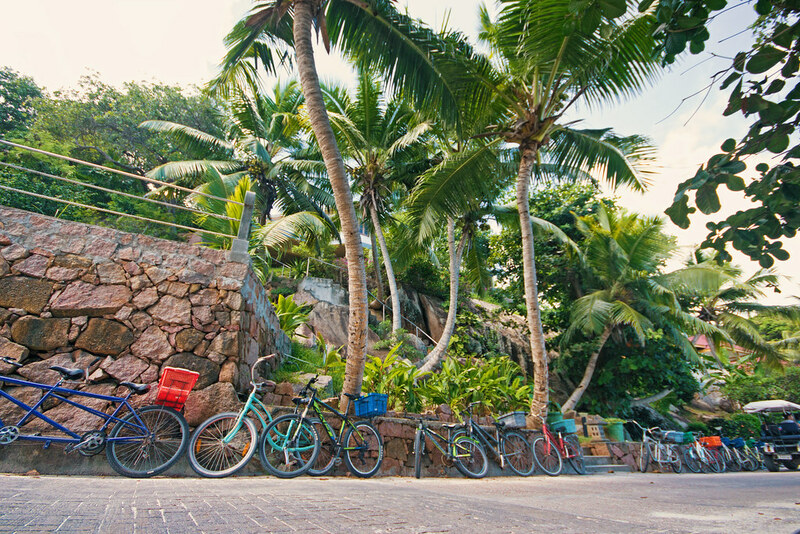 The bicycle island of La Digue. 9. La Digue’s Union Estate and the Tortoises. 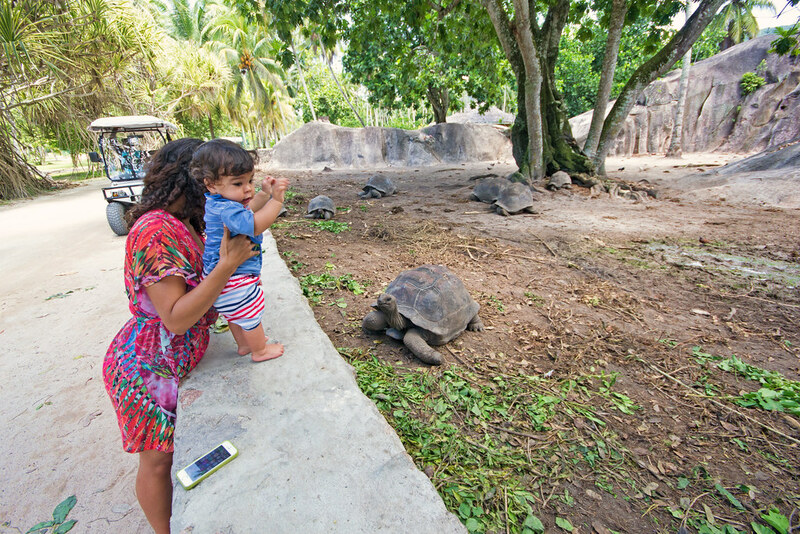 We paid an entry fee at L’union estate and spent some time feeding and watching the giant tortoises from the island of Aldabra ( sadly, the subspecies that lived on La Digue are extinct). We ran beneath the palm trees and in the garden with Caleb and past (vanilla) plantations. 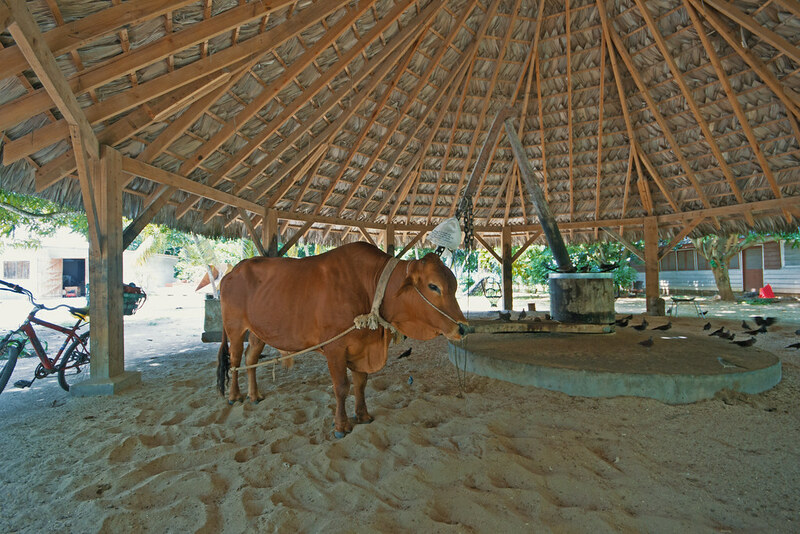 We had a demonstration on how oil was once extracted from the vanilla pod with a cattle with a traditional wheel. The ancient tortoises in L’Union Estate, La Digue. A child’s heaven beneath the plans in L’Union Estate’s garden. The traditional way of extracting vanilla oils. It’s true that I’ve saved the best for last because I’d like to think that this is one of my favourite beaches in the world. 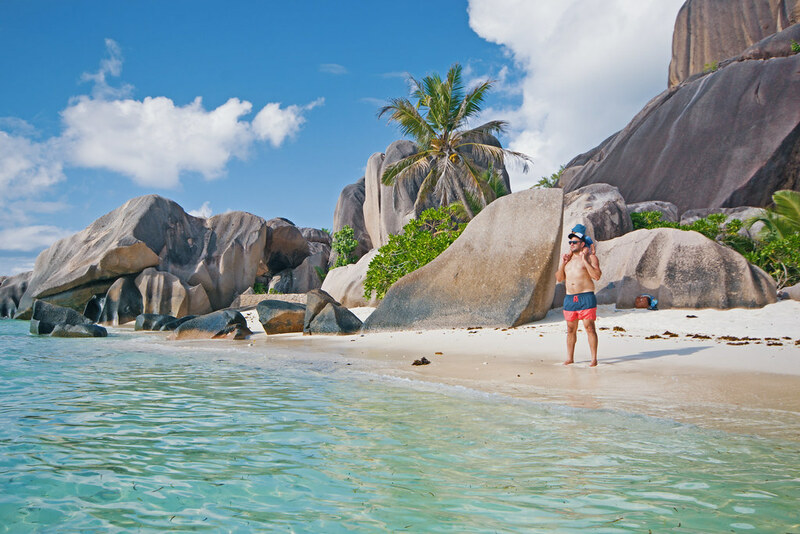 Tucked between towering boulders and dotted with just enough trees to provide shade, these little enclaves holding tiny beaches are truly romantic in every sense of the word. Everything here looked photoshopped to the naked eye and I napped with Caleb beside a hammock and swam with him in the water when it got to hot. We didn’t really ever want to leave here and reluctantly made our way past sun worshipppers soaking in the very last rays of the day as the light fell on the boulders. Vaughan and Caleb enthralled by this brilliance of these little beaches. How is this beach even real? 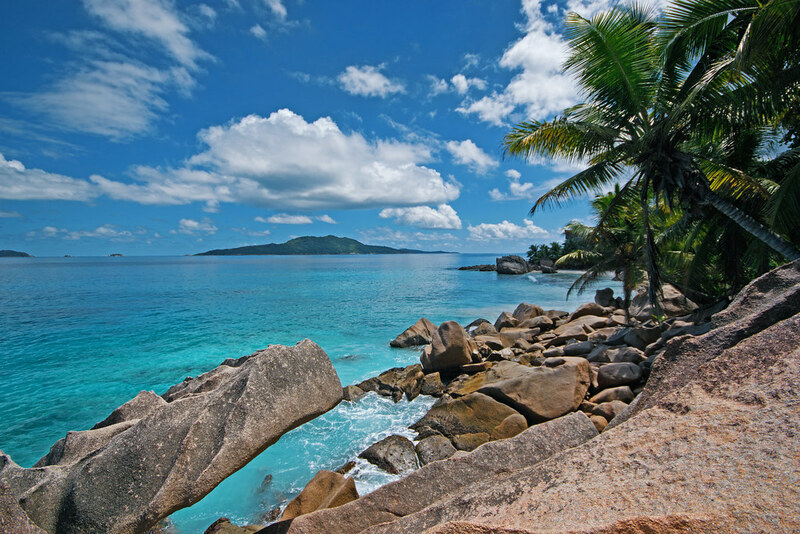 Anse Source D’Argent. 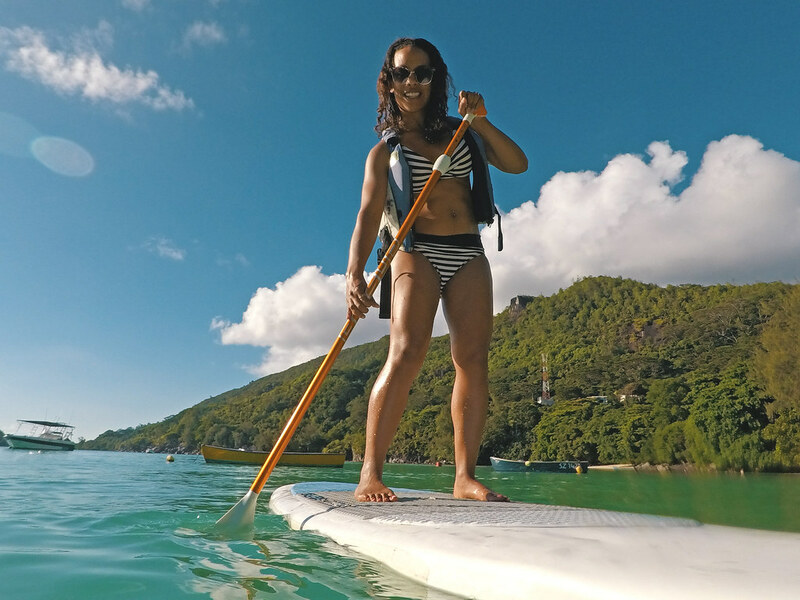 Beau Vallon: Coral Strand and Savoy Resort and Spa. 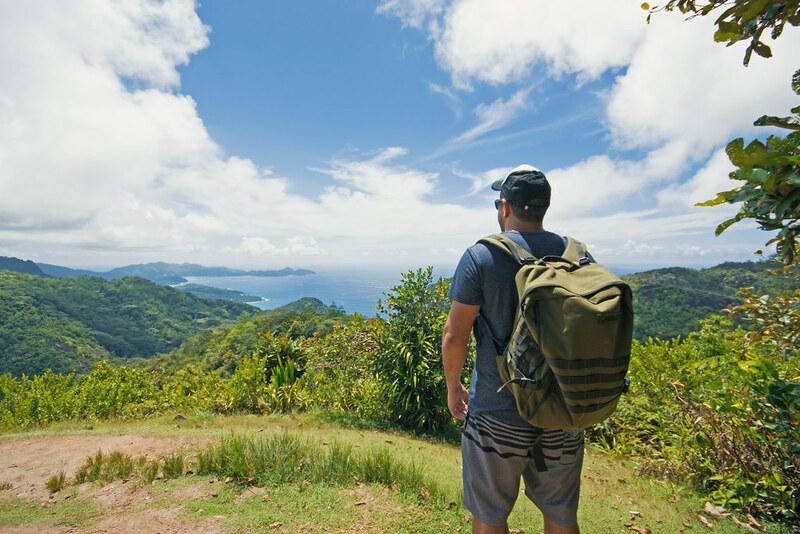 For more information on what to do on the islands of the Seychelles, visit the Seychelles Tourism Board. 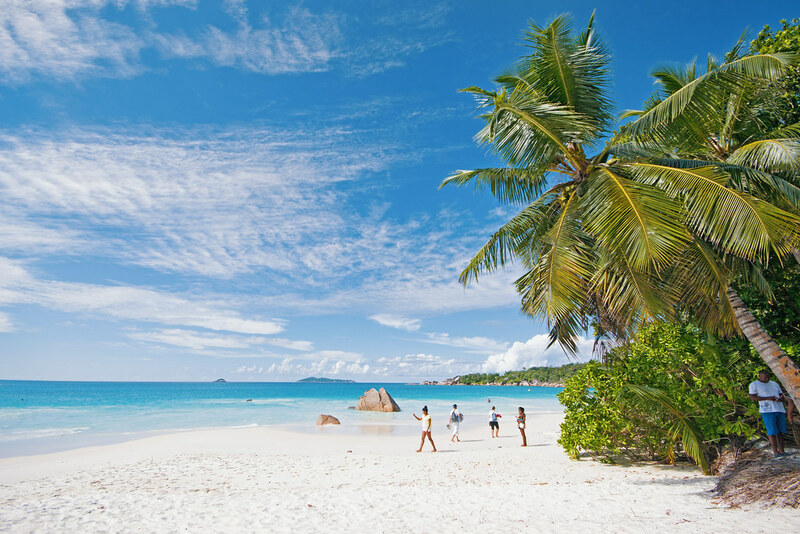 To find out the flight schedule and times of Air Seychelles, visit their website here: Air Seychelles. To watch my interview on the Expresso Morning Show broadcast on SABC3 in South Africa, click here: Seychelles on Expresso. Thank you to the Seychelles Tourism Board who hosted us for this trip to the Seychelles along with Air Seychelles who got us to the island. As always, all views expressed are our own.